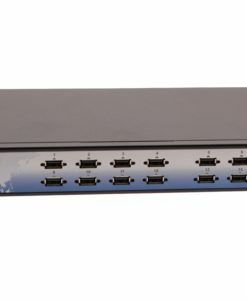 The CG-1600i-RM Industrial 16-Port USB 2.0 Rack Mountable Hub is a rugged, industrial-grade metal hub. The hub is compliant with USB 2.0 specification and can expand one USB port into 16 high-efficient USB 2.0 ports. Adds 16 USB 2.0 Compliant downstream ports. Incorporates Screw Lock cable connection security on all downstream ports. Powered by an Industrial grade switching power supply providing power to all devices. For industrial grade usage with wide temperature range needs. The CG-1600i-RM Industrial 16-Port Hub is designed for the use in industrial application under tough working environments. It is housed in a DIN-rail mountable metal case with screw holes for lockable USB and power cables. Next to each USB downstream port connector are two screw-lock receptacles for lockable USB cables to add extra reliability of connection. The terminal power input connector is with two screw holes securely locking the power wires to prevent them from accidental disconnection. The Rack-Mountable Industrial 16-Port hub supports USB 2.0 full speed of 12 Mbps and USB 1.1 low speed 1.5 Mbps. It is powered by an industrial-grade switching power supply, and each downstream port provides full 500mA power to the connected USB devices. the USB CG-1600i-RM incorporates hub chips for industrial usage with normal operation in wide ambient temperature from -40°C to 70°C operation in a harsh environment. All the USB signals are protected by 15KV ESD protection. Industrial-grade 16-port USB 2.0 Hub with rack-mountable metal case. Common mode filtering on all data lines. Over-current detection and protection circuit design. Provided a terminal block connector to support 5V 1A power for external devices. 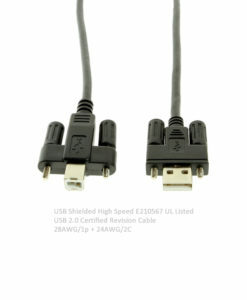 Supports USB 1.1 and USB 2.0 transfer speeds (1.5 ~ 480Mbps), automatic link and speed detection. Plug-and-Play; no software or drivers required. 15KV ESD immunity for serial interface protected. LED for power and USB status indication. All USB connectors with screw holes for lock the USB cable. Supports wide ambient temperature operation -40°C to 70°C(-40°F to 158°F). This device has 16 USB ports! I am currently using 13 of them with scanners and SDR’s They all work and are controlled through the computer. This device is built with high quality construction. You get what you pay for. I needed a USB hub for our service room as our demands have grown and this is what I found. Outside of seeing the 16-Port USB Hub on Amazon I thought, this is BIG! Once I opened the hubs box I could see it wasn’t as big as I thought for this size hub. The Hub is jet black with a very light texture to its surface. The USB Ports on the rear of the hub are clearly marked with the ports designation 1-8 on the top row and 9-16 on the bottom rows and basically split into two groups of eight with the USB type “B” and terminal power plug off to the left. Seems to be a good heavy duty well constructed unit. It also has 4 feet on the bottom and the sides are vented for heat distribution. This is a Rack Mountable hub and is a good size piece of equipment, this hub functioned exceptionally well as far as connecting to USB peripheral devices that are being used, which was expected. The one thing I should point out is that the LED indicators for both power to the unit from AC and power to the devices at the USB connector of the hub were a big help. The red AC power LED and green USB port LED’s were illuminated to see port connections were made properly. The hub installation was easy; it may have been harder taking it out of the box than setting up the driver for it. I am running Windows 8.1 and didn’t have any issues with installation or recognition of the hub. Despite having 16 ports, the hub connection to the host system is established only as one “Generic USB Hub” and will not display 16 additional ports which is proper function for the USB and Hub controllers. The Hub’s operation includes a built-in internal switching power supply of 100V~240V and is somewhat different than the operation of the USB devices connected to it. Because this is a hub, it is basically an extension of your host system’s USB port and will read devices when they are physically connected to it but the devices themselves are treated individually. As an example if you connect a USB peripheral that designates itself as a removable device such as a mass storage device, Windows will activate the “safe to remove hardware” icon in the system tray allowing you to shut the device off before removing it. By the same token, if the device is not manufactured or produced as a removable device, the hub doesn’t make it one and you will not have the option to stop it before removing from the system. At this point have found any cons with the item, it is rack mounted and working well. This USB hub was mounted into a 19 inch rack service room to handle multiple connections in the warehouse. In looking for the hub, I wanted something that would hold up well against where I was installing it and had some flexibility in the physical installation but also solid cable connection. I also didn’t want to mess with system configuration, I simply didn’t have time for that and this hub does the job well, which is why I chose it. I like the LED indicators as they can be seen from a distance (10 feet or so) when entering the service room and fit perfectly into the rack. I also found the screw lock cable it came with to be a great plus in making sure my initial connection was secure while moving around a bit. The 16 port USB 2.0 USB Hub has certain accessories that work with it. These accessories are what you can order if needed.